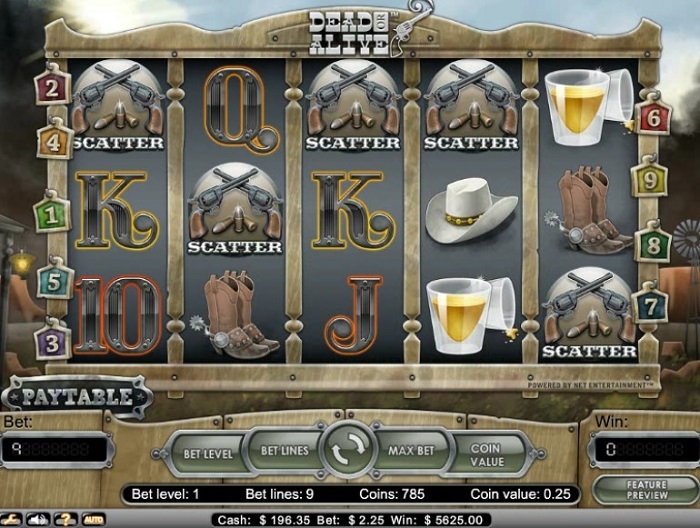 The amazing world of the Wild West is visible and all around on the Dead or Alive video slot from Netent. 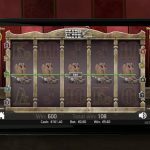 This Dead or Alive slot review shows everything you need to know about what makes this one of the most fun new slots around. It is a relatively basic game in terms of its bonuses and how it pays out to players but it does give off a fun atmosphere. It is not too hard to figure out how the game is run and what makes it a standout choice for all to have some real fun with. 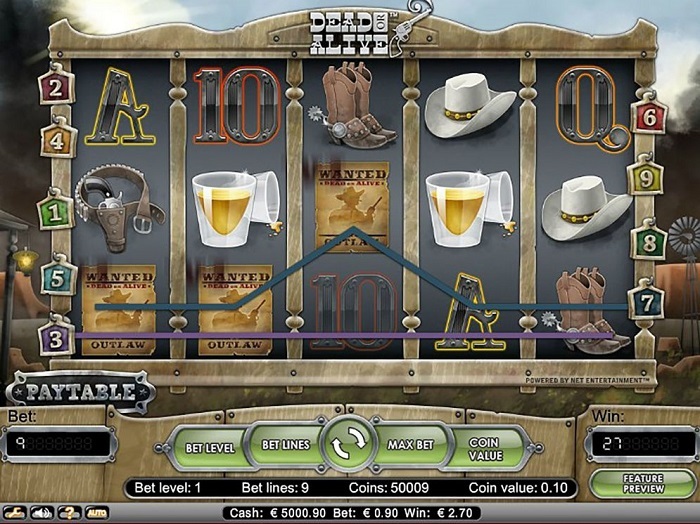 The theme featured on this video slot clearly highlights the action and thrill of the Wild West. It has a fine wooden building look to it while the cast iron look of the letters and other features around the place make this a fun game to look forward to. The symbols around here include a few six-shooters, some big cowboy hats, shot glasses and much more. It brings the days of outlaws and gunslingers out to the public in a fascinating and fun fashion. This part of the Dead or Alive slot review certainly shows that it has a good layout with a fun style in its own but much more deserves to be noticed while playing along with the game in general. The game menu uses a simple layout. It has buttons to help with adjusting the bet level and the coin value that can work in a game. 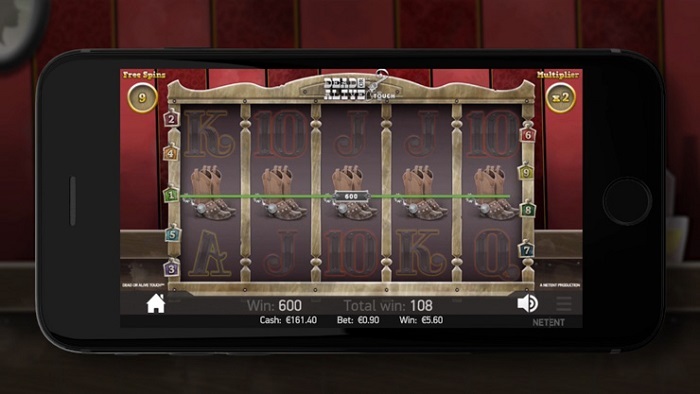 The slot has four betting levels while coins can go from 1 to 50 cents each. There are nine bet lines to use here. These lines go all around the five-reel layout. The lines in question are relatively basic for the most part as they go in mostly straight lines. There are a few bends here and there but these are mostly going to stick to the top or bottom rows of the game. The player does have the option to adjust the number of lines being used in a single spin. The player cannot just choose specific lines to be shut down though. The lines are activated in order. 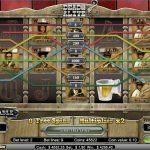 Considering the low cost needed for playing the game, it might be best for anyone to just stick with all nine lines in order to actually have a better shot at a stronger overall payout. The Max Bet button automatically starts a spin with the highest number of lines and coins to use in a single spin. This is based on what is in the player’s account and the value of the coin being used. The Wanted poster is a wild symbol. It can appear anywhere on the screen. The scatter symbol features two six-guns paired together. This also shows up anywhere within the game. The star is the sheriff’s badge and pays out the most above all the other basic icons to see here. The symbols are all organized in a spectacular manner that adds a nice total look that adds a fun way for all people to play and have fun. It is especially unique for how it offers a good overall arrangement that only adds to how the theme is run. 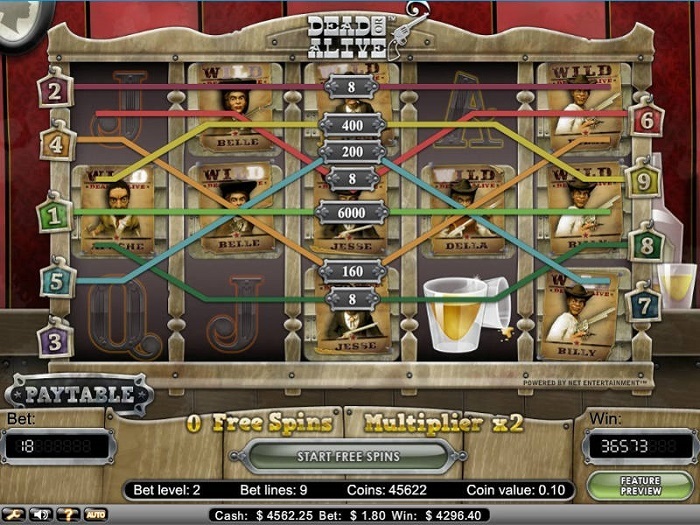 When three or more scatters show up, the player wins twelve free spins. Those spins pay out twice their regular payouts. The free spin feature can be retriggered once during the particular round. This works with twelve more turns regardless of the number of scatters that show up in the process. Sticky wild symbols also appear during the free spin round. Such wilds will stick on the screen during the entire round and will disappear after it is over. Five additional free turns are given out when one wild or more shows on all reels along the slot. These do pay out well although they only work within certain parts of the entire screen. There are some strong payouts to look into while playing here. 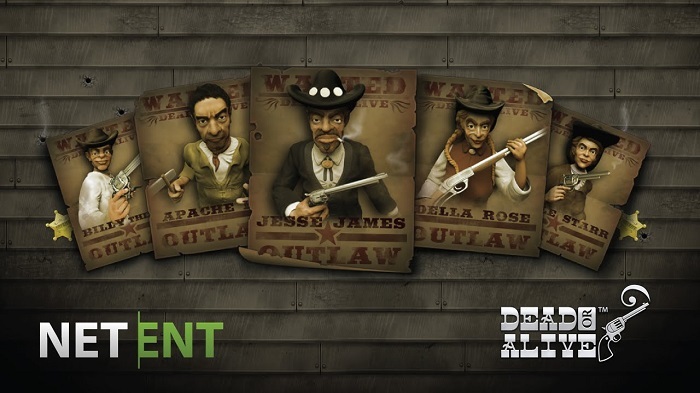 The highest basic total payout comes with 1,000 coins for when five of the sheriff stars appear on the screen. The pistol belt and cowboy hat also have some good payouts as they are the best icons that are outside of the basic ones being used. Five scatters will result in a 2,500 coin payout. 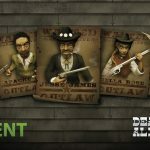 Five wilds will also produce a 1,500 coin payout. The wilds work best when they are on the same line although the scatters can be used at any point on the screen on any reel or line. Of course, the players who get enough scatters are going to get into the bonus round. The payouts are also doubled during the free spin round. That round becomes all the more important when the big totals being offered at that time are considered in general. 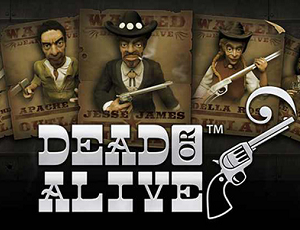 The basic arrangement of the Dead or Alive machine is sensible as it makes it easier for players to have fun on the game. 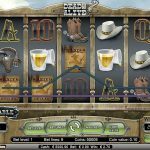 But if there is one thing this Dead or Alive slot review shows, it is that this machine provides players with a fun way to win big at an online casino. The ability for a player to win something strong here is important to notice as it offers a fun way to get the best possible playout that one could ever experience. Check this machine out at any casino that offers Netent games. 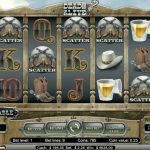 Seeing how Netent is such a popular name for casino gaming as it is, it should not be all that hard to find a place where a game can be found in. This game does have a good look to it that makes for a great way to have fun and enjoy a good game.